Thomas Albert Johnson known to one and all as "Codger" was Cardiff born and bred. As a boy he attended the South Church Street Docks School in the city. Codger only 5ft 8in tall and barely 11 stone in weight but he was a fearless player. Equally adept as a wing or centre, he made his Cardiff debut in 1920 at the age of 17 and went on to score 129 tries and five dropped goals in 187 games. In the 1924 – 5 season was club captain when the All Blacks were again among the opponents. 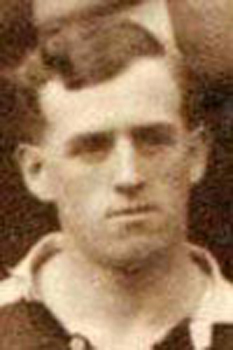 Codger Johnson gained 12 caps for Wales, captaining them against England at Twickenham in 1925, and also played for a combined Wales/England XV against a Scotland/Ireland side in the historic centenary match at Rugby School in 1923.